A star in college, Kelly missed most of his senior year due to a shoulder separation but was still taken in the first round of the 1983 NFL draft by the Buffalo Bills. 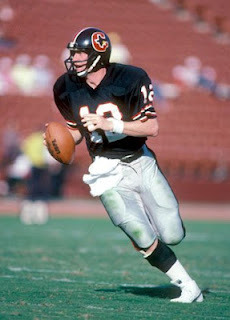 He was also chosen by the Chicago Blitz of the new USFL, who traded his draft rights to the Houston Gamblers. Kelly signed with the new team in the second-year league and also benefited from the extra time to recuperate while awaiting the spring ’84 season. He immediately became the starting quarterback as a rookie, directing Houston’s run-and-shoot offense. Gamblers went 13-5 to finish first in the Central Division while leading the USFL in passing yards (5311), scoring (618 points), and TDs (79). Lost USFL First Round playoff to Arizona Wranglers (17-16). 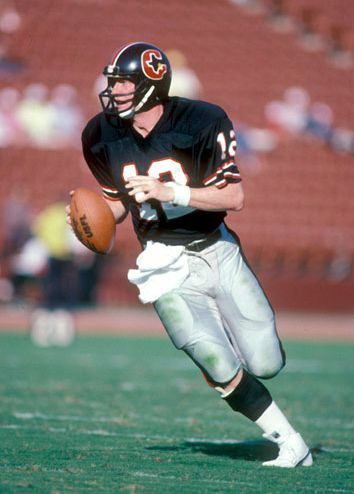 While Kelly missed several games due to injury in 1985, he still led the USFL in pass attempts (567), completions (360), yards (4623), TD passes (39), completion percentage (63.5), and overall passing (97.9) and the team again reached the postseason. With the end of the league, Kelly joined the Bills for the 1986 season and threw for 3593 yards and 22 TDs. He went to the Pro Bowl for the first of five times in ’87 and Buffalo made it to the postseason in 1988. In 1990 he led the NFL in passing (101.2) and the team won the AFC title, barely losing the Super Bowl. It was the first of four straight conference championships, marred by the failure to win any of the resulting Super Bowls. Kelly proved to be a tough competitor and savvy field general. He retired following the 1996 season having passed for 35,467 yards and 237 touchdowns with an 84.4 rating in the NFL along with 9842 yards and 83 TDs in the USFL. The Bills retired Kelly’s #12 and he was inducted into the Pro Football Hall of Fame, Class of 2002.